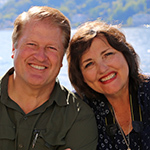 Maurine and Scot Proctor, Meridian’s editor and publisher, are currently in Haiti with 125 LDS medical, construction and translation volunteers from Utah. For one High Priest Group Leader, Francy Saint-Preux of the Croix-des-Missions Ward, this devastating earthquake that has hurled his country into crisis has served to reinforce his testimony that we are blessed when we do what we need to be doing. The Saint-Preux Family in front of their home in Port-au-Prince. Last fall, he and his wife, Marie, felt that they had become lax in doing everything they should do as members of the Church. They decided to step up their efforts-things like making sure they were reading their scriptures every single day and being more diligent in home and visiting teaching. He wanted to be stalwart, even in the little things. He felt keenly that the Lord would bless and prosper them as they gave their best and lived in accordance with the principles they knew. Daffydde and Daffkie Dade Saint-Preux smile with delight. Thus, on the fast Sunday before the earthquake, at 2:30 in the afternoon, he felt impressed to give his children blessings of protection. He gathered them and gave them each a blessing promising them safety. He felt certain he would not have received that impression had he continued to be a little lax. Francy Saint-Preux pauses to pose for the camera as he walks from the ward building to his home. Then, the Friday before the earthquake, he had an unusual dream that lingered and intrigued him long after he woke up. In his dream, the back retaining wall of his house had collapsed, and his neighbor’s wall had fallen, too. He did not see it as a prophetic dream, but certainly an unusual one, and he mentioned it to his wife, asking her what she thought it could mean. Francy takes us to his home to show us the events of the earthquake for his family. It was only after the quake that he realized he had seen exactly what would happen in the earthquake a few days before. His neighbour would be killed when the wall fell. The day of the earthquake, Francy and Marie had sent their youngest daughter, Daffkie, to see her grandmother. Their daughter, Daffydde, was doing homework. Francy shows us the simple gate that would not open on January 12. They left their home to visit a sick member of the ward and were only a few steps away at a gate they often used, when, for some odd reason, they could not open the gate-a gate they used several times every day. Francy assures us he had always opened this gate with ease before. Then the earth started to tremble and shake. They hesitated, not realizing what was happening. At first they thought it was a big wind. The wall that collapsed behind the stuck gate killed Francy’s neighbor. The roaring intensity of the quake increased. Behind the gate through which they would have just passed had they not had the difficulty, a cinderblock wall collapsed with a crash. Surrounded by many other unstable walls, they pushed quickly through the gate so Francy could move Marie to an open courtyard where she would be safe. Walls were falling down all around the family. As they ran down a little path, another wall swayed and shattered behind them. It could have been a movie. It could have been Indiana Jones barely escaping death by a hair. But this was real-two people protected when walls were falling on every side. The Saint-Preux Family were spared in this nearby courtyard of a neighbor. In all, they barely scraped by three walls before they collapsed. Francy ran back for their oldest daughter and secured her safety in the courtyard, but they panicked because they weren’t sure what had happened to their youngest child who had gone to see her grandmother. Daffkie was safe and so was her grandmother. Francy ran by houses, sunken and twisted, and then came to grandmother’s house where the front entrance was blocked by fallen pieces of the house. Sick with anxiety, he called out his daughter’s name, “Daffkie! Daffkie!” His relief was enormous when she called out, “Poppy!” Grandmother was safe as well.